Great News... at least for giant defense contractors like General Dynamics and others that will profit handsomely from the production of an archaic Cold War weapons system reborn with a new name. The specifications for the New generation of Trident submarines are in, and no matter how cut it (or the production costs) it's not going to be cheap. The article below says that "the Navy will now work with lead ship designer — General Dynamic Electric Boat — to squeeze every dollar it can out of the design to hit the cost target set by OSD." Of course, with tax time coming soon - VERY SOON - the government will be squeezing taxpayers for that 50 to 60 percent of our tax dollars (depending on whose numbers you use) that goes to military spending. New Trident figures prominently in those figures. 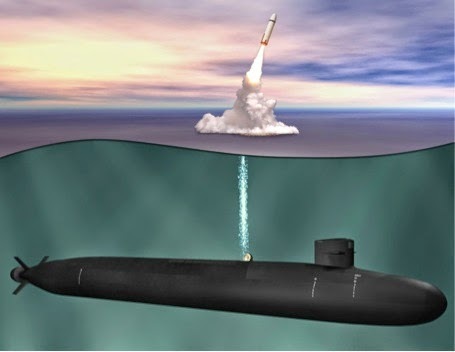 Between the construction cost, estimated at nearly $100 billion for 12 submarines, and lifetime operational costs estimated at roughly $350 billion - and who knows how much a successor missile to the current Trident will cost - that's a huge pile of money wasted on a weapons system that is so destructive and radiologically devastating that it can never be used. The saga continues, and New Trident is sailing full speed ahead (towards nuclear Armageddon). Read the following article to get the specs. An undated artist’s rendering of the Ohio Replacement. Want a new sub? Play the fear card!